As much as I work with SSDs, it still surprises me when I open a box and see an external drive that fits neatly into the palm of my hand and offers terabytes of capacity. 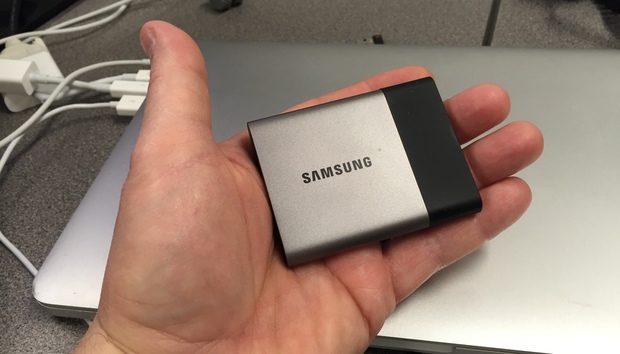 Samsung's Portable SSD T3 is one of those drives. It's got up to 2TB of storage space and the advantage of the new USB 3.1 interface, which opens the bandwidth floodgates. 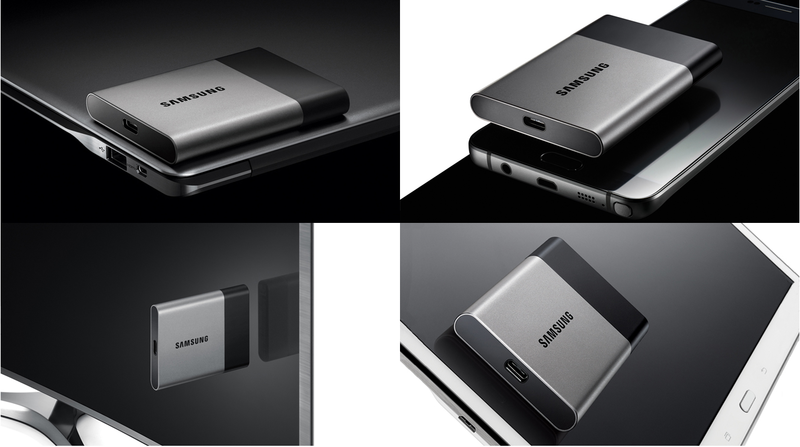 The T3 is the second generation of Samsung's "T" line of portable SSD drives. The T1 drive, announced a year ago, offered up to 1TB of space (for $600 retail, $357 on Amazon), as well as 500GB and 250GB capacities. The T3 is offered in all the smaller capacities, as well as a 2TB model for $850 (see Amazon prices). A 1TB model will retail for $430; the 500GB and 250GB models will retail for $220 and $130, respectively. The added weight is due to the fact that the T3 is more ruggedly built. Instead of the T1's plastic case, the T3 features a shock-resistant metal case and internal frame that Samsung says can take up to 1,500G of force, allowing it to survive a drop of about 6 feet. Samsung also (thankfully) provides a much longer USB cable for the T3. The T1 had a stingy 4.25-in. cable, while the T3 has a 17.5-in. cable. The T3's specifications highlight impressive performance that peaks at 450Mbps, which is within 100Mbps of the fastest internal 2.5-in. SSDs that use SATA interfaces. (Compared to an external hard disk drive, it's about four times as fast.) My benchmark tests showed the drive came close to the manufacturer's specs, though they fell a bit short. The T3 uses Samsung's 48-layer V-NAND (3D NAND), which stacks layers of flash memory atop one another like microscopic skyscrapers, creating a vastly denser storage technology over previous planar NAND products. Channel Hole Technology (CHT) connects connects NAND flash vertically with one another through a cylindrical channel that runs through stacked cells. Samsung markets the T3's speed as most favorable for the streaming content on the Web today. After all, who wants to wait 10 minutes to upload or download a movie or a photo album? However, while the new T3 uses the USB 3.1 protocol (the T1 uses USB 3.0 with a Micro-B plug), both sport basically the same bandwidth. That's because the T3 uses USB 3.1 Gen 1, which has a 5Gbps data transfer rate, the same as USB 3.0. (USB 3.1 Gen 2 sports 10Gbps transfer rates). The Samsung SSD T3's USB 3.1 Type-C connector is compatible with an array of desktop and mobile devices. What the T3 does have over T1 is the USB Type-C connector, which fits into a port whether upside-down or right-side up; there are no orientation limitations. What affects the T3's speed as much as the external USB bus is Samsung's firmware: TurboWrite. TurboWrite, which the company first unveiled in 2013 in its 840 EVO internal SSD, creates a high-performance write buffer to which new data is first written. The host system writes data to the drive's single-level cell (SLC) NAND flash high-performance buffer at accelerated speeds; during the idle periods, the data is moved from the buffer to the primary storage region of the SSD. In short, the TurboWrite feature is meant to simulate the performance of a SLC NAND flash in the multi-level cell (MLC) NAND that the T3 SSD uses. The result: This SSD is fast. Using Blackmagic Disk Speed Test software for OS X, I attached the T3 to my MacBook Pro running OS X Yosemite (v10.10.5) on a 2.6GHz Intel Core i5 processor and with 16GB of RAM. The benchmark tests recorded a top sequential read/write speed of 432Mbps and 409Mbps, respectively. The Blackmagic benchmark tests of the T1 SSD showed its write speeds topped out at 353Mbps, with read speeds of 415 Mbps. Then a curious thing happened on the way to testing performance. Using the T3, I uploaded a test folder with 10.5GB of data made up of 1,523 files, ranging from .TXT files to .JPG photos as well as .MP4 and .MOV videos. The folder took 58 seconds to upload. By comparison, the T1 was able to upload the same 10.5GB file in just 39 seconds; no matter how many times I performed the test, the outcome was the same -- the T1 was faster uploading the folder. I asked Samsung about those results and requested a second T3 to check the speeds; the second drive delivered the same performance. Next, I uploaded a 2GB mp4 movie; it took 6 seconds. I tried a larger movie with a different format -- a 4.2GB .m4v folder (Guardians of the Galaxy); that took 14.6 seconds. The upload speeds were the same as the T1, so something on my 10.5GB folder was slowing the T3's upload speed compared to the T1. I asked Samsung about the upload discrepancy, and they didn't have an answer as to why my T3 may be performing more slowly than the T1. On the left is the USB 3.1 Type-C Connector (used on the Samsung T3 SSD) and on the right is a USB 3.0 Micro-B Connector (used on the Samsung T1 SSD). "Our engineering team tested the performance comparison between T1 and T3 for 10GB file transfer in the same system environment. Based on test data, the T3’s performance was the same or faster than T1," Samsung stated in an email reply to Computerworld. The T3 is equipped with AES 256-bit hardware encryption for security across devices based on Windows, OS X and Android. Even if the drive should fall into the wrong hands, the data stored on it would be inaccessible without the user-generated password. The T3 also works with a new Samsung Portable SSD Android mobile app, which supports password changes and remaining capacity checks. The T3 comes with a three-year limited warranty and will begin shipping Feb. 29. Overall, the T3 is the smallest 2TB portable external SSD on the market today. At $850, however, it's an extremely expensive way to carry around a lot of data -- even if it's got a small footprint. Cost, however, is relative. Most SSDs -- particularly external backup drives -- will run you about as much money, if not more. The least expensive external SSD with at least 1TB that I could find is one from Transcend that costs $378, and that drive doesn't offer hardware-based encryption or a Type-C connector. Portable external hard drives, such as Seagate's Backup Plus Slim, offer 2TB of capacity for $79 (price at press time); 4TB will run you $124. Western Digital also offers a 3TB USB 3.0 portable hard drive for $123 (price at press time). Both of the latter drives come with 256 AES hardware-based encryption, but they are also larger, slower and more likely to break from shock. For the additional $774, you get the T3 -- a much smaller and lighter external drive that will also be four times as fast and far more durable because there are no moving parts. It's your wallet, you decide.